Probing the nature of resilience through the stories behind the people who thrive in adversity. Researchers define resilience as “achieving success despite serious challenges.” However, as Jay (Clinical Psychology/Univ. of Virginia; The Defining Decade: Why Your Twenties Matter—And How to Make the Most of Them Now, 2012, etc.) shows, resilience encompasses behaviors that make it a far more complex phenomenon. Drawing on the personal stories of famous people and her own clients, the author insightfully explores how that apparent invincibility masks other, more painful realities. 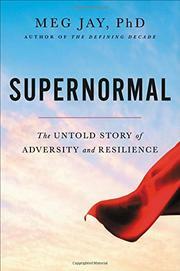 Like Superman, the comic book hero, “supernormals” are ordinary people forced by circumstance to overcome extreme adversity. Marilyn Monroe, for example, escaped life as a foster child to become a Hollywood legend. Yet she paid a heavy personal price that included self-doubt and bouts with depression. In examining the unsung lives of more ordinary supernormals, Jay reveals some of the tactics they use to survive their particular circumstances. Her client Paul, a nuclear engineer and naval officer and former victim of childhood bullying, channeled anger into vigorous intellectual and physical pursuits. Mara, who lived with a bipolar mother, sought spaces within her mind and in the world outside her home where she could find temporary respite. Jessie learned how to cope with a physically abusive sibling by becoming hypervigilant and treating her life like a “chess game.” Yet because supernormals spend so much time honing their coping mechanisms, they often leave other parts of themselves underdeveloped. In particular, many find it difficult to form lasting and/or close relationships with others. As a result, they may live with “incredible alienation” that stands in the way of their forming loving bonds that could save them. In the end, the true “battle between good and bad” that supernormals face is not with hostile people and/or environments: it is with themselves. Jay’s book is both compelling and hopeful. She amply shows that though internal battles may not end, the joy that comes from living a balanced life is always possible. A well-researched, abundantly documented, readable work of social science.